à la chute de l’Empire perse achéménide. Stanley M. Burstein: Ctesias’ Sources: A Suggestion. Kiarash Gholami: Some Remarks on the Inscription and Att ribution of a Transitional Arab-Sāsānian Dirham from Merv. John Hyland: Hystaspes, Gobryas, and elite marriage politics in Teispid Persia. Of Gravel (nīrang ī jashan ī burzigarān o nīrang ī sang-rēzā yaštan). Daniel T. Potts: The lands of the Balahute and Lallari. 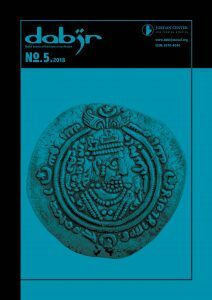 Razieh Tassob: Language and Legend in Early Kushan Coinage: Progression and Transformation. Carlo G. Cereti: Review of Foltz, Richard. Religions of Iran: From Prehist ory to the Present. London: Oneworld Publications, 2013. 314pp. ISBN 978-1-78074.
taḥrīrhāye digar, yāddāšthā va vāže-nāme [The Elamite Version of Darius the Great’s Inscription at Bisotun. Introduct ion, grammar of Achaemenid Elamite, transliteration, Persian translation, comparison with other versions, notes and index], Tehran: Našr-e Markaz. 1394š/2015. Pp. 268. ISBN 978-964-213-272-0.